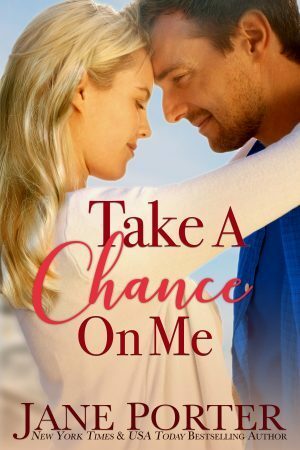 Take a Chance on Me is set in the Marietta, MT universe and is the third book in Jane Porter's Love on Chance Avenue series. Like I have discovered with the Marietta books, you don't need to have read the previous books in the series to enjoy this one. I discovered the Marietta universe during my Christmas story binge read. Since then I've been wanting to read some of the non-Christmas ones so I jumped at the chance to read Jane Porter's newest novel in the universe. I read her 1850s set Chrismas story Away in Montana and really enjoyed it. And I'm happy to say I enjoyed her present-day story of romance. If you haven't read any of the Marietta books, then this is a nice one to start with even though it is number 3 in the series. Tyler Justice has come to Marietta to convince his grandmother to move to Austin, TX. However, his grandmother is deeply connected to the community and enlists the help of her hairdresser Amanda Wright to convince him of how great the town and people are. So as a reader you get a great overview of the "prominent" (in terms of those who have appeared in other books) and the major landmarks of the town. The book is more than just a tour guide to Marietta. Amanda and her sisters have been on the outside of Marietta society most of their lives having been raised on the "wrong side of the tracks". And it is a stigma that Amanda still fights today. So when Tyler comes accusing her of trying to swindle his grandmother, she is ready for battle. Unfortunately, no matter how much they want to hate each other, there is a magnetism between them that neither has ever felt. Take a Chance on Me is a sweet, clean romance that was a perfect palate cleanser after three heavy literary mysteries. This fluffy romance would be an excellent spring pairing with a glass of wine and a hammock.